Kerala is a long stretch of enchanting greenery in the South West Coast of India. The tall exotic Coconut palm dominates the landscape. The sea, backwaters, lakes and waterfalls - 30% of Kerala landscape is dominated by water. 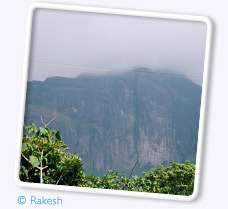 Much of Kerala's notable biodiversity is concentrated and protected in the Agasthyamalai Biosphere Reserve in the eastern hills. Almost a fourth of India's 10,000 plant species are found in the state. Among the almost 4,000 flowering plant species (1,272 of which are endemic to Kerala and 159 threatened) are 900 species of highly sought medicinal plants. Its 9,400 km� of forests include tropical wet evergreen and semi-evergreen forests (lower and middle elevations 3,470 km�), tropical moist and dry deciduous forests (mid-elevations 4,100 km� and 100 km�, respectively), and montane subtropical and temperate (shola) forests (highest elevations 100 km�). Altogether, 24% of Kerala is forested Two of the world's Ramsar Convention listed wetlands Lake Sasthamkotta and the Vembanad-Kol wetlands are in Kerala, as well as 1455.4 km� of the vast Nilgiri Biosphere Reserve. Subjected to extensive clearing for cultivation in the 20th century, much of Kerala's forest cover is now protected from clearfelling. Kerala's fauna are notable for their diversity and high rates of endemism: 102 species of mammals (56 of which are endemic), 476 species of birds, 202 species of freshwater fishes, 169 species of reptiles (139 of them endemic), and 89 species of amphibians (86 endemic). These are threatened by extensive habitat destruction (including soil erosion, landslides, salinization, and resource extraction). Eastern Kerala's windward mountains shelter tropical moist forests and tropical dry forests, which are common in the Western Ghats. Here, sonokeling (Indian rosewood), anjili, mullumurikku (Erythrina), and Cassia number among the more than 1,000 species of trees in Kerala. Other plants include bamboo, wild black pepper, wild cardamom, the calamus rattan palm (a type of climbing palm), and aromatic vetiver grass (Vetiveria zizanioides). Living among them are such fauna as Asian Elephant, Bengal Tiger, Leopard (Panthera pardus), Nilgiri Tahr, Common Palm Civet, and Grizzled Giant Squirrel. Reptiles include the king cobra, viper, python, and crocodile. Kerala's birds are legion-Peafowl, the Great Hornbill, Indian Grey Hornbill, Indian Cormorant, and Jungle Myna are several emblematic species. In lakes, wetlands, and waterways, fish such as kadu (stinging catfish and Choottachi (Orange chromide Etroplus maculatus; valued as an aquarium specimen) are found. It is composed of Neyyar, Peppara and Shendurney Wildlife Sanctuaries and their adjoining areas of Achencoil , Thenmala, Konni, Punalur, Thiruvananthapuram Divisions and Agasthyavanam Special Division in Kerala. It is the habitat for 2,000 varieties of medicinal plants, of which at least 50 are rare and endangered species. Rare animals include the tiger, Asian Elephant, and Nilgiri Tahr. Agastyamalai is also home to the Kanis, one of the oldest surviving ancient tribes in the world. Ecotourism is popular in the area.